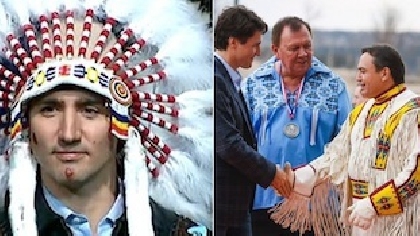 Russell Diabo is concerned with the chiefs of the Assembly of First Nations and their fawning over Prime Minister Justin Trudeau and his Liberal government. Such outright acceptance could spell trouble for First Nations people down the road, he told Windspeaker. The policy advisor to the Algonquin Nation Secretariat pointed out that National Chief Perry Bellegarde took no opportunity in his opening address to the Special Chiefs Assembly Dec. 6 to condemn the Liberal government for failing to follow through on the orders of the Canadian Human Rights Tribunal (CHRT) to provide adequate funding for children on reserve. And the Prime Minister’s address to the assembly that same day was met with a standing ovation from the chiefs. “The Liberal party has a history of broken promises….there’s a big difference between what they’re saying and what they’re doing. “When Trudeau says they’re going to decolonize the laws… well, we’ll see,” said Diabo. Diabo has a checklist, and as far as he’s concerned, Trudeau’s accomplishments aren’t as impressive as the Prime Minister makes out. The Promise to the United Nations to fully adopt the UN Declaration on the Rights of Indigenous Peoples. Trudeau also announced that an Indigenous Languages Act would be legislated. “A year later there’s still a big gap between what they say and what they do,” Diabo said. While he concedes the Indigenous Languages Act is beneficial, and changes in programs and services —such as education, housing, and safe drinking water—are being addressed, Diabo asserts the Liberals have fallen short in other areas. “You’re not going to build any kind of future for self-determination without lands, territories and resources, because most reserve lands are only big enough for residential purposes. You need a bigger land base and you need access to revenue sharing or something,” he said. Diabo is also critical of Trudeau’s claim that the Liberals have accepted UNDRIP without qualification. What Trudeau is invoking is, basically, national interest, said Diabo. He points to the Liberal government’s non-compliance on three orders from the CHRT to take action on child welfare on reserves. He notes continued court action against First Nations by the Trudeau government. And Diabo is not as confident as Trudeau is that his government has been meeting the TRC’s Calls to Action. In fact, Toronto-based historian Ian Mosby undertook a study of the TRC’s Calls to Action and, with help from crowd-sourced information, determined only five had been completed. According to Mosby’s calculations, the federal government, Crown corporations and non-profit organizations had each completed one Call to Action, while the churches have completed two. The federal government’s completed Call to Action is the launch of the national inquiry into missing and murdered Indigenous women and girls. Diabo is also impatiently waiting for action to be taken on Trudeau’s promised review of policy and law. “There’s a whole history of colonialism, despite his promises, he hasn’t addressed yet,” Diabo said. Bellegarde is quick to point out that Trudeau has only been in power a year and has committed $8.4 billion to Indigenous peoples, more than even the Kelowna Accord promised. Bellegarde says it will take many years to close the socio-economic gap. “The position AFN is taking is they’ve decided they’re going to try and work with this government. (Bellegarde) has defended it already saying it’s better than the last one. "I don’t disagree but this government is still operating on stealth and secrecy. There needs to be more transparency on what AFN and the Prime Minister’s Office are negotiating… because the real rights holders of Aboriginal treaty rights are the grassroots peoples, not just the chiefs,” said Diabo. It was alleged that secret negotiations between former AFN National Chief Shawn Atleo and former Prime Minister Stephen Harper on the First Nations Control of First Nations Education Act led to Atleo’s resignation. Diabo says Bellegarde runs the same risk. “I think the potential is there for that because my understanding is that most of these negotiations are taking place between the Prime Minister’s Office and the National Chief’s office,” Diabo said. He worked with the AFN under three different national chiefs at three different times holding three different positions spanning 1981 to 1997. “I know AFN is an advocacy body, but you have to be very careful. You can maybe work out some principles and things like that, but those need to be ratified. “Under AFN charter, it needs to be ratified by the Chiefs in Assembly…. And I would even say that if you’re going to go by the principles of the courts, even the Chiefs in Assembly resolutions aren’t good enough. You need to make sure you’re getting out … into the regions and communities and making sure there’s sign off on these things at that level, because the courts are saying that’s where the Aboriginal treaty rights are, on the ground,” Diabo explained. Diabo was also involved with the Liberals in the 1990s, instrumental with Jean Chretien’s Red Book platform. “So I’m seeing déjà vu. This is the same kind of thing where we worked on the promises and then Chretien got in and broke them. Trudeau in 2015, he made the promises. I think he made the promises because he was campaigning against the NDP, but when he found out he had a majority government facing a Conservative opposition, I think he’s narrowly interpreting his promises now, keeping an eye on them to the right as the ones he has to face off in the next election…. “He’s using his majority in Parliament to force through how he wants to see things going, including the promise of the UN declaration,” said Diabo.